It’s Spring time (finally) and FINS wants to celebrate our favorite thing of all! YOU, our customers! So, for the next month it’s all about customer appreciation -> READ UP!! When you place an order we ask for your Phone # – this gives you points, then at 300 points you’ll receive 15% Off your check. And, for Customer Appreciation Month your 300pts will get you a FREEFINS Jersey T! 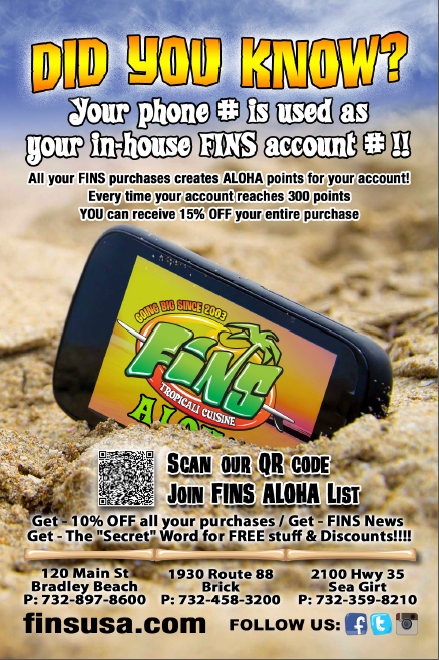 Join the ALOHA Mailing List – as many of you already have – When you turn in your confirmation e-mail you’ll receive a FINS Aloha Club Card for 10% Off every time you come in. also gives you the “Secret Word” giving you exclusive discounts in every e-mail! Write us a review on any website – show it, and get $5 FINS Bucks. Got a party coming up? Save your receipt and get 10% off your next Catering order 30 days from your last receipt date! Bought a Smoothie? Get a Smoothie Punch Card – 10 Smoothie is FREE! 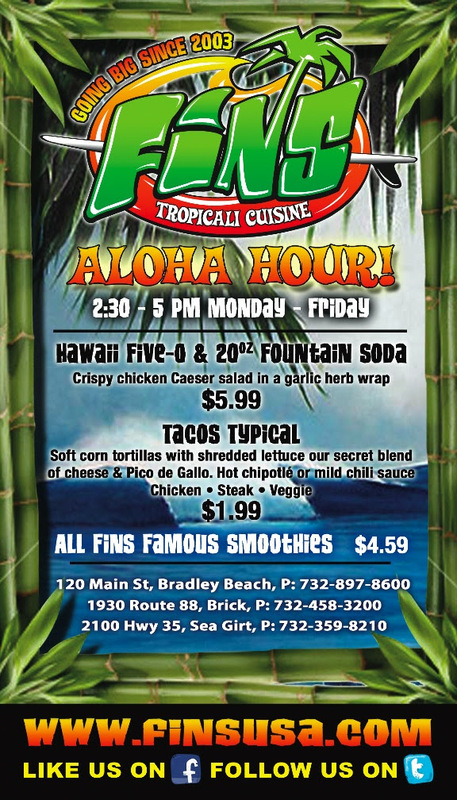 Don’t forget that every weekday FINS runs the Mahalo Lunch Specials 11-2:30 and the Aloha Special 2:30-5!! Thank you Troy D. for the awesome feed back!!! Buy 1 Smoothie get 1 HALF OFF! 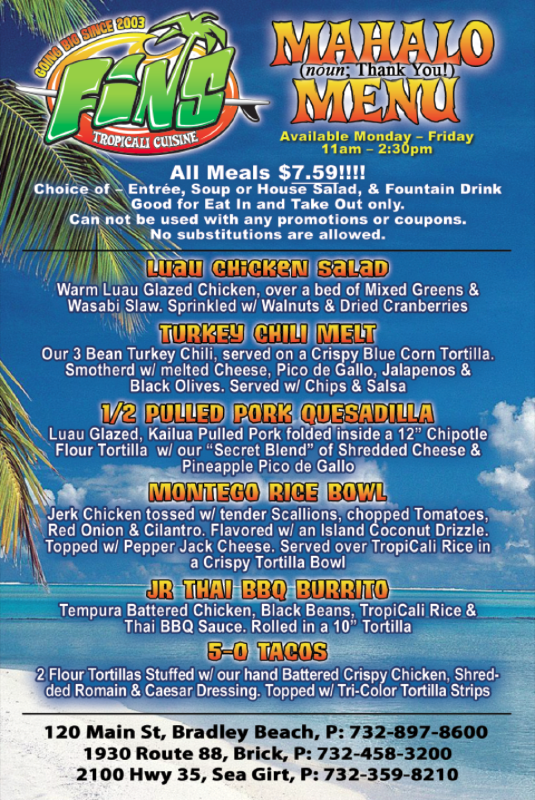 Make sure your family and friends sign up on our e-mail list so they too can get the SECRET WORD and be the first to know of our new SPECIALS! 6/21 – 1st Day of Summer!!!!! Spicy Jamaican Jerk Pulled Pork, sweet Plantains, topped w/ Mango & crunchy TropiCali Lettuce on a warm Flour Tortilla.